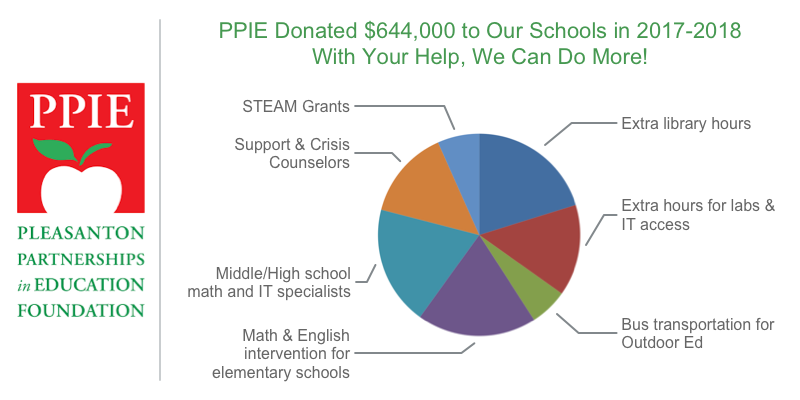 Donate to PPIE so Alisal can continue and expand these benefits – and respond to our Fall Survey to guide what PPIE should fund in the future! We welcome ALL donations - $100 to $1,000 per student – and our goal is greater family participation! $500 is recommended (compared to $1,000 for many school foundations) and $1/day ($18/month with our 10 month payment plan) is highly welcome! PPIE offers benefits and recognition for all family donors (includes total family giving + matching funds) with Pleasanton Weekly and Annual Report notices.